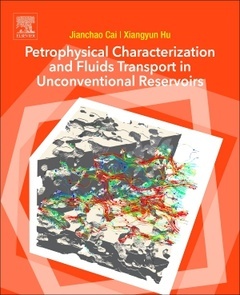 Petrophysical Characterization and Fluids Transport in Unconventional Reservoirs presents a comprehensive look at these new methods and technologies for petrophysical characterization of unconventional reservoirs, including recent theoretical advances and modelling on fluids transport in unconventional reservoirs. The book is a valuable tool for geoscientists and engineers, working in academia and industry. Unconventional reservoirs, including shale, coal and tight sandstone reservoirs, have received more and more attention in recent years. The main challenge of development of unconventional reservoirs is how to accurately characterize its complex microstructure and the mechanism of multi-phase/multi-scale flow and transport in these structures. As a result of this challenge, many novel technologies and approaches, including petrophysics, multi-scale modelling, rock reconstruction and upscaling approaches have been proposed and developed. Geologists, Geophysicists, Exploration Geologists, Seismologists, Reservoir engineers and Soil physicists. Professor Jianchao Cai, Hubei Subsurface Multi-scale Imaging Key Laboratory, Institute of Geophysics and Geomatics, China. Jianchao Cai received his B.Sc in Physics from Henan Normal University in 2005, and MSc and PhD in Condensed Matter Physics from Huazhong University of Science and Technology in 2007 and 2010 respectively. He joined the Institute of Geophysics and Geomatics at the China University of Geosciences (Wuhan) in 2010. From July 2013 to July 2014, he visited University of Tennessee-Knoxville, where he was a professor of Geological Resources and Geological Engineering. Dr. Cai’s research interests are in micro-transport phenomena in porous media and fractal theory and its application. He has published more than 80 peer-refereed journal articles and 8 books/chapters. He is the founder and Editor-in-Chief of Advances in Geo-Energy Research and serves as an associate editor for Journal of Natural Gas and Engineering. Professor Xiangyun Hu, Hubei Subsurface Multi-scale Imaging Key Laboratory, Institute of Geophysics and Geomatics, China. Xiangyun Hu received a Ph.D degree in mineral resource prospecting and exploration from China University of Geosciences (Wuhan) in 2000. Since 2005 he has been a professor in the Institute of Geophysics and Geomatics at the China University of Geosciences (Wuhan). His current research focuses on rock physics, 3D MT/CSAMT/CSEM forward modeling and inverse problems, high performance parallel computation, and geoelectrical characteristics of the Tibetan Plateau, as well as integrated geophysical interpretation. He has published more than 100 peer-refereed journal articles and 3 book chapters.